The 2018 legislative session is off to a good start. Less than two weeks into the session an agreement was reached on the Hirst decision, leading to the passage of the capital budget. After extensive negotiations over many months, and with the leadership of the House Republican Caucus, a Hirst solution, Senate Bill 6091, was passed by the Legislature last week. I voted for the measure and it passed with strong bipartisan support, 66-30 in the House of Representatives and 35-14 in the Senate. As a reminder, the “Hirst decision” refers to the controversial state Supreme Court decision from October 2016 that restricted property owners – mainly in rural areas of the state – from drilling wells on their property. They also ruled that in order for counties to comply with the Growth Management Act, they had the responsibility to ensure water availability for land-use decisions, instead of relying on the Department of Ecology (DOE). The ruling had a negative impact or construction, real estate and economic development in our rural areas. The Hirst fix addresses many of the concerns we had with the court ruling. It provides some certainty and a long-term solution surrounding our state's water law. The legislation grandfathers in existing wells and removes the mandate the court put on the counties to find their own legal water. The DOE will create concise charts for county planners so we know what is being required under water law. Reaching a Hirst solution allowed us to move forward with the long-awaited capital budget. The “construction” budget, as it is sometimes referred to, keeps our state's infrastructure priorities in place. During the governor's State of the State address he unveiled the details of his carbon tax plan as part of his continued battle against climate change. His plan would tax carbon emissions generated by transportation fuels and power plants at $20 per metric ton beginning July, 2019.The tax would increase by 3 and a half percent each year, plus inflation. It is projected to raise $1.5 billion over the first two years, and $3.3 billion over four years. This proposal doesn't incentivize reducing carbon – it just puts an even heavier tax burden on working families. The governor's own staff indicated the proposal would likely raise electricity costs 4-5 percent, natural gas 10 percent, and fuel costs, 6-9 percent or about 18 – 20 cents a gallon. At this point, I am not sure the governor has the support necessary to get his proposal through the legislative process. He would need 100 percent support from his party and there are some Democrats not ready to support it. I remain active in health care related legislation this session. I am still working on my Tobacco-21 bill. House Bill 1054 would prohibit the sale of cigarettes, tobacco products, and vapor products to persons under the age of 21. According to the 2014 U.S. Surgeon General's report, nearly 95 percent of smokers started smoking before age 21. The average age that a daily smoker has a first cigarette is 15, and the average age a person starts daily smoking is 18. One of my goals with this legislation is to get most of the tobacco off of our school campuses. Healthier young people also means a positive impact on long-term health care costs. The bill was passed by the House Finance Committee earlier this week. There are a number of bills before the Legislature related to opioids. Two bills I have co-sponsored are House Bill 1339, which would provide restrictions on prescriptions for opioid drugs, and House Bill 2325, which would require practitioners prescribing an opiate to review the patient's controlled substance history in the prescription monitoring program. House Bill 1339 passed the House last year but died in the Senate. House Bill 2325 received a public hearing early in the session. Last year, I was a strong proponent of House Bill 1046, which would have delinked all state tests from high school graduation requirements. We passed it three times in the House only to watch it die in the Senate. We ended up with a pared down version, House Bill 2224, that enables more students to graduate on time but did not delink any tests. We continue our work on getting HB 1046 through the legislative process. Not letting students graduate because they did not do well on a test in the 11th grade is ludicrous. State testing requirements have nothing to do with a student's future ability to learn. I do not want a state-imposed testing assessment to hold these students back and I know firsthand this is happening in the 17th District. In collaboration with the Office of Superintendent of Public Instruction (OSPI) and the State Board of Education (SBE), I have legislation moving that would modify functions and duties between the two agencies related to learning standards, career and technical education (CTE) course equivalencies, and other responsibilities. House Bill 2824 has had a public hearing and is expected to be voted out of the House Education Committee next week. What is the best way to follow what is going on in Olympia? Below are some links and websites to follow the Legislature and some of the things I am working on. Capitol Buzz: It is a daily electronic clip service with headlines and stories from media outlets around the state – newspaper, radio, television. Click here to subscribe – no cost. Check out my Website: www.representativepaulharris.com/. Here you can find my news releases, email updates and bills I have sponsored. 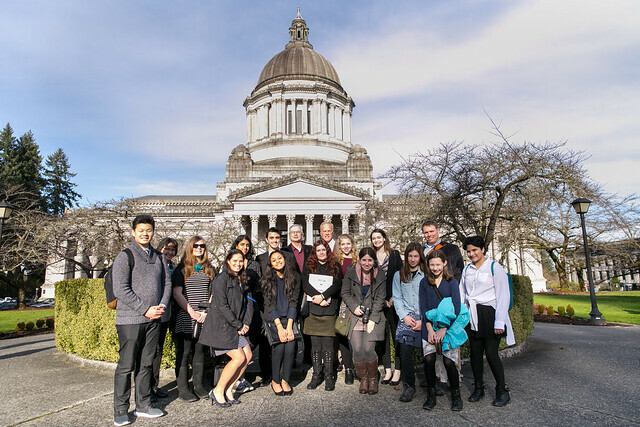 Legislature's Website: You can get bill reports, track legislation, view committee agendas and information about upcoming activities in the Legislature at: www.leg.wa.gov. Please contact me if you have any questions, thoughts or concerns about the legislative session or state issues. I can be reached at paul.harris@leg.wa.gov or call my office at (360) 786-7976. I look forward to hearing from you!